Previously sold in these Rooms, 30 October 1994, lot 369. 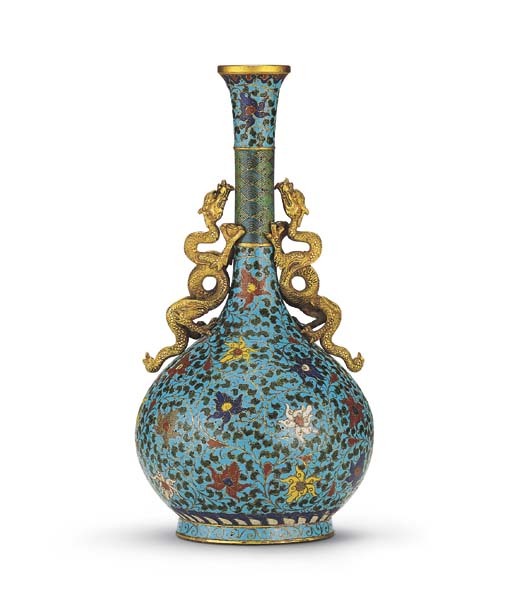 Compare the present lot with a slightly smaller 16th/17th century vase of similar proportions but lacking the dragon handles, included in the Phoenix Art Museum exhibition, Chinese Cloisonné: The Clague Collection, 1980, Catalogue pl. 20. Another closely related piece in the Victoria and Albert Museum is illustrated by B. W. Robinson, Chinese Cloisonné Enamels, London, 1972, pl. 5.